Spray 13x9-inch (3-quart) baking dish with cooking spray. In 12-inch nonstick skillet, cook beef and onion over medium-high heat 5 to 7 minutes, stirring frequently, until beef is brown; drain. Stir in tomato sauce, water, ketchup and mustard. Simmer 5 minutes, stirring occasionally. Meanwhile, in medium bowl, beat egg with fork or wire whisk. Stir in ricotta cheese and 2 cups of the cheese blend. Spread 1 cup beef mixture over bottom of baking dish. Top with 4 uncooked noodles. Spread half of the ricotta mixture over noodles; top with 1 1/2 cups beef mixture. Repeat layers once with 4 noodles, remaining ricotta mixture and 1 1/2 cups beef mixture. Top with remaining 4 noodles, beef mixture and 1 cup Cheddar cheese. Cover with foil; refrigerate at least 8 hours or overnight. Heat oven to 350°F. 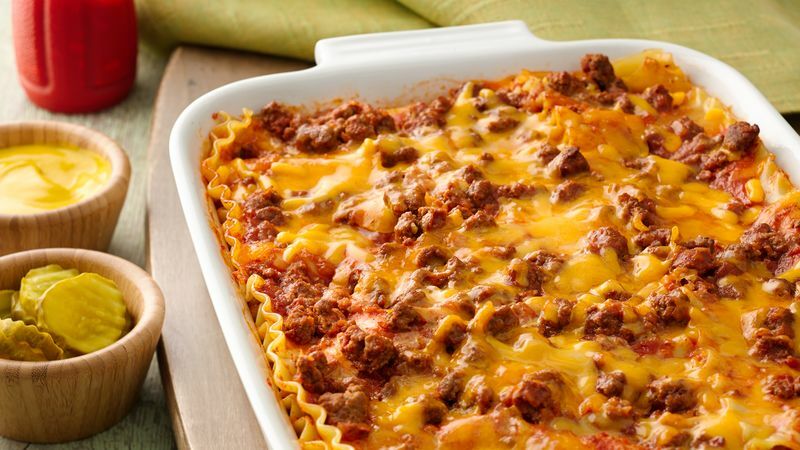 Bake lasagna, covered, 45 minutes. Uncover; bake 25 to 35 minutes longer or until bubbly. Remove from oven. Cover with foil; let stand 5 to 10 minutes before cutting. Just before serving, top with lettuce, tomato and pickles. Serve with additional ketchup if desired. Uncooked noodles will bake to a slightly chewy texture. For softer texture, omit the water and use cooked noodles. Although this recipe is super to make ahead, you can bake it right away, too. Just cover the dish with foil and bake as directed.